The Vermont Fish and Wildlife Department says a young moose that wandered through suburban backyards and along a busy road in the northern Vermont town of Milton had to be put down for safety reasons. 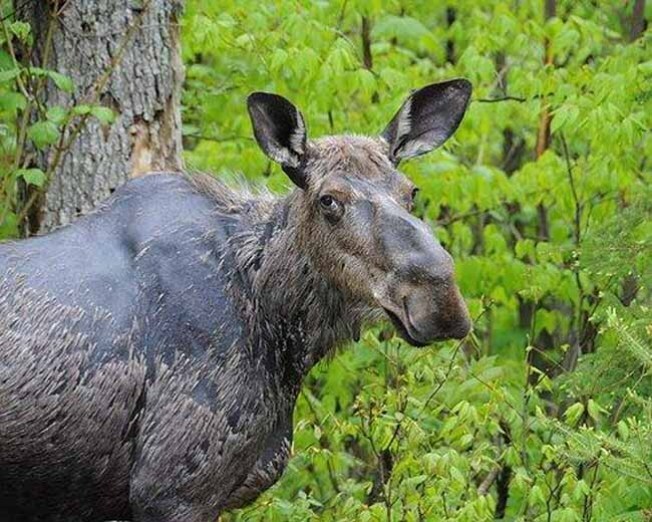 The department told the Milton Independent that the female yearling showed no signs of disease, but said a warden determined that the moose was a public safety hazard. The moose walked along Route 7 on Thursday, slowing traffic while drivers snapped photographs. The decision to kill the young moose sparked a great deal of criticism on social media, with many people saying other options - including transporting the animal out of the area - should have been considered. "The warden shot the moose in Milton today because he believed the moose was posing a public safety risk. Our standard procedure is to attempt to herd the moose away from people and traffic before shooting it, however in this case the warden did not believe there was time to do that. We will send the head of the moose to be tested in case it was sick. We do not tranquilize them in these situations because of uncertainty about where they will go and what they will do when they are tranquilized. Obviously if it wandered into Route 7 after being tranquilized it would have been a hazard." The carcass of the young moose was given to Army National Guard for meat.